Ms. Jang has been a top prizewinner in many competitions. In March, she won Third Prize at the 48th Annual Eastern Connecticut Symphony Instrumental competition and was the youngest finalist at the 2007 Young Concert Artists International Auditions in New York City in January. Ms. Jang won two prestigious International music competitions in 2006. In the 25th Kingsville Bowed Instrument Competitions, Ms. Jang won first place in the Junior Division, first place in the Concerto Contest and was top prizewinner in the final competition for Solo Performance with Orchestra. Among her awards for winning the Kingsville Competition, Ms. Jang was invited to the 2006 International Allende Music Festival in Mexico with full scholarship where she performed as a soloist with the Allende Symphony under Maestro William Barbini. In 1998, she became the youngest-ever to advance in the semi-finals at Moscow’s International Competition in Russia. As a result of being the overall winner of the Suburban Symphony Orchestra in 2001, Ms. Jang made her orchestral debut performing Wienawski’s: Violin Concerto No. 2 under Maestro Robert Calhoon. In May of 2002, she performed with the Northwestern Senior Orchestra at St. James Episcopal Cathedral, also being a participant in the Young, Gifted and Stellar Program. Ms. Jang won First Place in the 2004 Sejong Music Competition’s Senior Division for Violin, was winner of the Musicians Club of Women of Chicago Scholarship audition and overall winner of the Midwest Young Artist competition in Chicago. In 2005, Ms. Jang won Grand Prize at the 2nd US & String Concours of Chicago. Ms. Jang was the 2006 Young Artist winner of the Society of American Musicians. 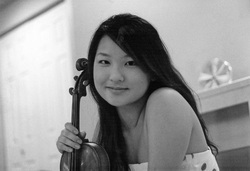 Susan Jang currently studies violin with the renowned Almita and Roland Vamos at the Music Institute of Chicago.